1. Decide to relax for a couple of evenings. 3. Realize the game has some pretty nice pixel art and decide to take screenshots to study later. 4. Get frustrated with having to stop and start playing to use the print screen and snipping tool to save the screenshots. 5. Spend the the next two evenings coding a screenshot tool instead. So made a small program that runs in the background and saves screenshots to a folder when you hit the Print Screen key. 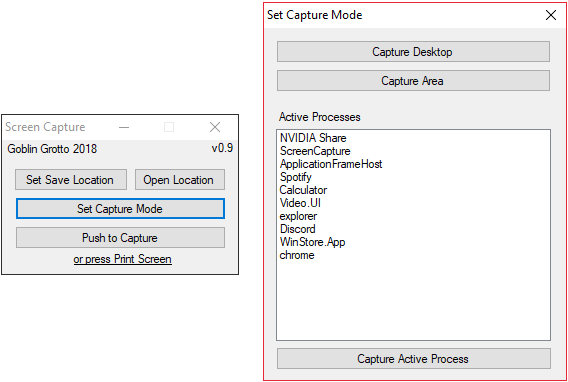 It got a couple of different modes to select from: Capture the whole desktop, capture a selected area of the desktop, or capture a window. It's a pretty simple little tool and there is probably stuff that do similar things but better out there, but I failed to find a free one with some quick googling. Figured I might as well post it if someone else has need for it. It only works on windows and requires .Net Framework 2.0 (but it should be preinstalled on windows). The whole window capture thing seems to be a bit wonky. It doesn't work on all programs for some reason, like rpg maker 2003. If it fails it will revert to capturing the whole dekstop instead. I only tested it on Windows 10, Dr.ace had some issues with getting it to work on Windows 7. So maybe it works, maybe it doesn't, who knows. That's one way to do it, I suppose. I just use the GeForce Experience's screenshot tool. I mean, it's only really available to Nvidia cards (which that one screenshot suggests you have), and only to models from a certain date and later, but it's a good option. Impressive as ever, you see something missing and you just go ahead and fill that hole. Hmm, for some reason I thought it just did videos. But yeah, makes sense it can take screenshots as well.